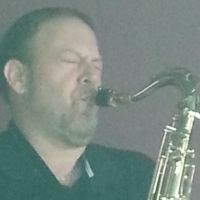 Additional Info: Professional saxophonist & keyboardist with many years of experience performing with a variety of professional jazz, pop, and rock groups spanning all genres as well as recording tracks for artist albums and radio & TV commercials. * BA degree in Music from James Madison University 1985 w/ concentration in music business and internship in audio sound engineering & production. * Session experience performing as a contracted musician in recording studios throughout the East Coast. * Experience working as an audio-sound engineer and producer on several artist and compilation projects. With the advent of modern audio technology, one of my goals has been to work towards performing as an entire backing horn section, which provides interesting challenges in itself. * Hawk WD-S411 tenor saxophone (modified), Rousseau Metal Jazz mouthpiece #8 facing, Vandoren Jazz & Jazz-Red reeds. * TC Helicon VoiceLive 2 signal-processing/mixer/effects/harmonizer.